I’ve not had a full night’s sleep in over 18 months…tired doesn’t even come close. Pretty much as soon as that little blue line appeared, Mr Sandman packed his bags and walked out on our 30 year love affair. I always expected that having a new baby would be tiring and that there would be sleepless nights; but what I didn’t realise was that these sleepless nights would commence their reign very early in my pregnancy and would be very much out staying their welcome nine months into parenthood. So I guess in my all consuming lethargy I should be planning an uprising…? Well you may be surprised to hear that I’m not. I’ve made a conscience decision to very much go with the flow. As soon as you have a baby, all people seem to be interested in, is how your bundle of joy sleeps. As adults we define each other by personality traits; whether we laugh a lot, whether we are kind, thoughtful, patient, high maintenance, laid back…but these traits seem to be slightly disregarded when it comes to a baby…from what I can make out, babies seem to be defined by their sleep habits. My little girl is a happy, curious, lively, intelligent, switched on little thing, but she’s not the best sleeper in the world and for a time, this became a huge issue for me. I’ve read a thousand websites, books, blogs and articles bestowing advice on ‘how to make my baby sleep’ and how I have ‘created bad habits’ by rocking or nursing her to sleep; and I have beaten myself up after each and every one. But it wasn’t until I was tearfully questioning my ability as a mother, after she had woken up 25 minutes into her morning nap (which according to the books should be 90mins if she is a good baby), that I had an epiphany. In a bid to avoid having a baby who is defined by her nighttime waking, I myself was letting sleep (or the lack of it) define me as a mother. So, things have slightly changed in our house…I try not to get upset and feel like a failure when her naps don’t measure up to Gina Ford’s standards, I ignore anyone who tells me that controlled crying is the only way forward (it is a mile away from my parenting style anyway) and I am not feeling guilty when I bring her into our bed at 4am without even trying to settle her into her cot. As my own mother said, she won’t be there forever and will eventually settle into a good sleeping habit (yes mum, I do listen). In the grand scheme of things, the night time parenting won’t actually last very long, so I’m embracing it and trying to remember my early twenties when having five hours sleep was a regular occurance. To some people, this may make me a soft touch and a glutton for punishment, but I would rather be that than a hypocrite. 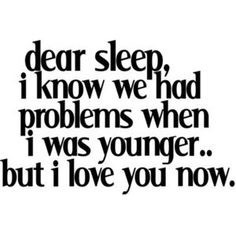 This may seem like an odd statement but I myself don’t sleep well…I never have done. But strangely, nobody really asks whether I go through the night! Waking up in the night for me has always been commonplace, so maybe I am slightly more understanding when S does it too. So much so that many a night I have been known to clamber in to her cot and lie beside her so at least we’ve both got a little company in our dreamless state! As long as my little girl remains healthy, happy and continues to thrive I’m happy to go with the flow. I may be tired but I’m no longer letting sleep rule my life, define my child and create an issue…we’ll get there in time and hey, you can sleep when you’re dead, right? I seem to have jumped on the bandwagon. Not that long ago I was grumpily scrolling through Facebook (or babybook as I had lovingly and begrudgingly renamed it) moaning about how many pictures of babies were ‘clogging up my timeline’; and now here I am, with a baby of my own, not only beating them, but joining them and actually going a step further. I am blogging. I keep asking myself, “why on earth would anyone want to read your subconscious drivvle about your mundane life?” and I’ve come to the conclusion…most people won’t. But, in a time where our lives are saturated by the constant stream of ‘updates’, whether it be from friends, people we’ve not seen in 20 years or from strangers we pretend are our friends online, we often don’t have much choice over the content with which we are fed and let’s face it…quite often we simply don’t care. However, I figure that a blog is slightly different-you choose to read it! So if you have stumbled onto this website and are waiting for a funny anecdote about jagerbombs and all day Sunday drinking, you might want to pop back over to Facebore (and maybe scroll back through my timeline a few years). I think the world of blogging has become a safe haven for those people who have something to say but don’t want to break the strict but unsaid rules of social media. Mainly Facebook. The first rule of Facebook? You don’t talk about Facebook. No wait, that’s not it. The first rule of Facebook is you do not talk about…CHILDREN. If you break this very simple but very strict rule, you are at risk of being permanently ostracised by all of your friends without kids, who will use the excuse that ‘she’s changed’ and the ‘unfollow but remain friends’ button will become synonymous with your name. I know this because I was one of those twitchy fingered ‘unfollowers’. Facebook is the school playground of social media…if you wanna be one of the cool kids then keep your updates about your child progeny to yourself and stick to the safe topics-pub, food, birthdays and humorous videos of dogs falling over. Twitter is not such an issue as it’s slightly more transient and let’s face it, who can fit their daily sleep related battles into 140 characters anyway. As for Instagram, the amount of likes I was receiving from Latvian women ‘looking for a friend to share the long nights with’ drove me to private my page and lock it down! I probably contravene all of the social rules when it comes to instagram as it is full of pictures of my daughter but I think Instagram is for family and the etiquette police are slightly less gung-ho than on Facebook!